Charles O. Perry, a sculptor who created dozens of mathematically inspired works for plazas and sculpture gardens throughout the United States and abroad and created Continuum, the knotted black Möbius strip that stands in front of the Smithsonian's National Air and Space Museum in Washington, died on Tuesday at his home in Norwalk, Conn. He was 81. Perry was an architect working for Skidmore, Owings & Merrill in San Francisco when he began making sculptural models at night in a garage. In 1964 his works were exhibited in a one-man show at the Hansen Gallery that sold out and earned him a commission from the city of Fresno. That year he also won the Prix de Rome, an award that sent him to study sculpture at the American Academy in Rome, where he stayed for the next 14 years to practice architecture and make large-scale works of sculpture that drew inspiration from the geometry inherent in natural forms. Continuum, completed in 1976 for the new Air and Space Museum, is a bit of topological whimsy that plays with the peculiarities of the Möbius strip, which has one continuous surface and one edge. "In this case, the edge of the sculpture portrays the path of a star as it flows through the center of the sculpture's 'black hole' into negative space-time and on again into positive space," Mr. Perry told Ivars Peterson for the book Fragments of Infinity: A Kaleidoscope of Math and Art (2001). 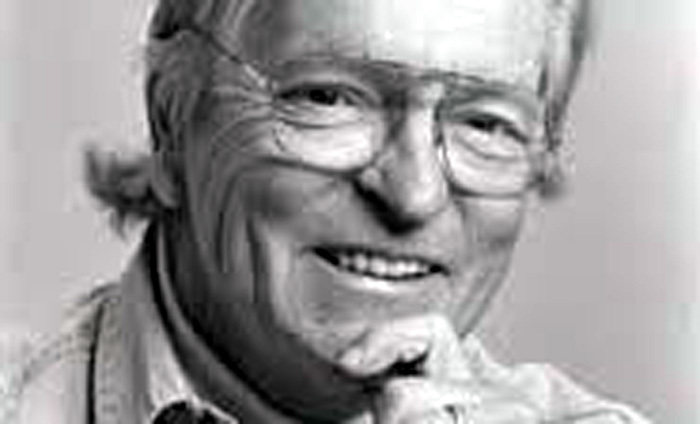 Charles Owen Perry was born on Oct. 18, 1929, in Helena, Mont., where his father owned a successful gold and gem mine. He served in the Army as a forward observer with an artillery unit in Korea, where he was awarded a bronze star for bravery and invented his own gun sight out of scrap parts to achieve better depth perception. After returning to the United States, he enrolled in the School of Art and Architecture at Yale, earning a master's degree in architecture in 1958. At the suggestion of the painter Josef Albers, he experimented with a variety of materials in a quest to discover their inner nature. In so doing, he became interested in the rhombus and invented plastic rhombic hexahedrons that interlocked to form novel shapes. These were later exhibited as art at the 1969 Spoleto Festival in Italy and, under the name Perrygons, sold as construction toys through the Museum of Modern Art. The artistic possibilities of geometric forms, and the mysteries of the universe's physical laws, provided Mr. Perry with an inexhaustible source of material. The Möbius strip reappeared in the sculptures Calligraphic Möbius and Helix Möbius Mace, both in the Crystal City development in Arlington, Va.; Continuum II at the Marina Center Holdings Building in Singapore; and Solstice, at the Bank of America Building in Tampa, Fla., an assemblage of silver pipes described on its base as "a two-thirds twist triangular torus Möbius." Mr. Perry explored other shapes in Shell Mace"(Shell Oil Company, Melbourne), the bright-red, calligraphic Rondo (Kinshicho Station, Tokyo) and Eclipse"(Hyatt Regency, Embarcadero Center, San Francisco), a gold-colored sphere — technically a pentagonal dodecahedron with the faces spiraling outward — composed of 1,440 pieces of gold-colored, interlacing aluminum tubes. Mr. Perry also designed gold and silver jewelry for Tiffany & Company, a semi-abstract chess set made of nickel-plated tubing, and sculptural puzzles. In the early 1990s he designed several chairs: an ergonomic stacking chair, known as the Perry Chair, for Krueger International; the Uno office chair for Steelcase; and the Virtuoso for Virco.